Health & Safety is a cornerstone of the AFI group of companies, and we are committed to promoting good Health & Safety practice to our customers and the wider market. As part of our team we have a number of experienced Health & Safety professionals who are active members on a number of IPAF committees. We are also an active member of a number of industry forums and discussion groups committed to safe practice in the use of MEWPs. 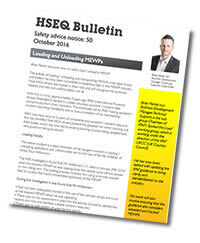 As part of our strong commitment to Health and Safety we produce HSEQ bulletins. These bulletins give news, views and updates on Health, Safety, Environment and Quality topics, please see below for previous issues.